Results of the character election announced. Dead or Alive Xtreme 3: Fortune for PlayStation 4 and Dead or Alive Xtreme 3: Venus for PS Vita will launch in Japan during spring 2016, Koei Tecmo announced during a Tokyo Game Show stage event. A slide shown during the event said PlayStation VR support is under consideration, but producer Yosuke Hayashi outright said it will be supported. So expect an official announcement at some point later on. 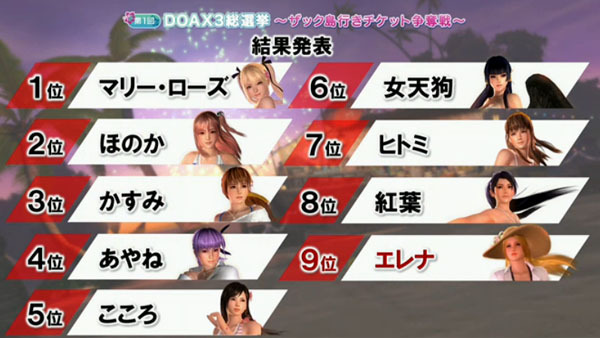 The publisher also announced the results of the character election, confirming the game’s nine playable characters. For Twitter updates on Dead or Alive Xtreme 3, follow @Zack_Island.